This pretty, fresh-tasting tomato soup is David Chang’s riff on Greek salad: He tops it with tomatoes, olives, honeyed cucumbers and feta. This recipe riffs on the classic American combination of cream of tomato soup alongside grilled cheese sandwiches. In addition to fresh tomato, the recipe calls for plump, oil-packed sun-dried tomatoes—they contribute loads of flavor and give the soup a thick, luscious texture. 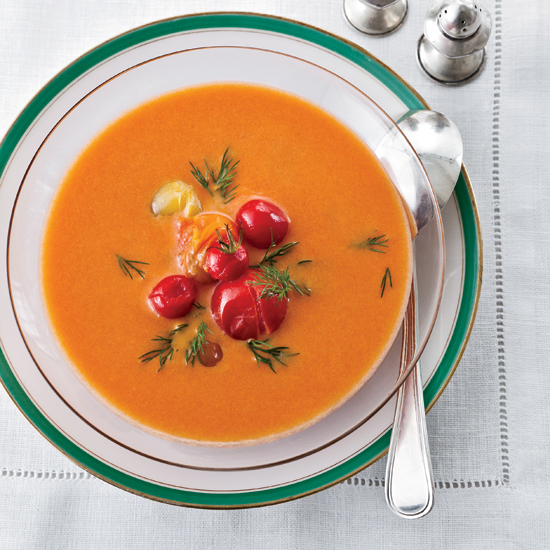 The secret to this creamy, delicate, fresh tomato soup is sweet onion, which cuts the acidity of the tomato. For this comforting soup, chef Alex Guarnaschelli cooks fresh and canned tomatoes separately for layers of flavor. She then purees some of the soup and leaves the rest chunky to give it a lovely texture. This super-fast soup requires just 15 minutes of active cooking time. "The quality of the tomatoes is key in this recipe," star chef Gabriel Kreuther says. "Try to find heirloom Brandywines—they have a lot more flesh."